John Swanson has a lifelong fondness for Fourmile Creek. “I grew up playing in Fourmile Creek as a kid,” he says. Swanson is the watershed management authority coordinator for Fourmile Creek, along with two other watersheds in the Des Moines area. Following is an overview of improvements planned and underway in each of Fourmile Creek’s three subwatersheds. Lower Fourmile Creek in and near Des Moines is being developed into a greenway as blocks of houses are removed. “It’s basically going to be a natural conservation area,” Swanson says. It currently has a bike trail and will soon have restored woodlands, wetlands, and pocket parks. Downhill from Grandview Park in Des Moines, the city is building a stormwater wetland and sediment basin forebay designed to help clean water from 46 acres before it reaches Fourmile Creek. The $150,000 cost of implementation is split between the city and a Water Quality Initiative grant from the Iowa Department of Agriculture and Land Stewardship (IDALS). This work should be completed by late June 2018, according to Swanson. Bicyclists crossing under Northeast Broadway Avenue south of Interstate 80 will see another improvement. Steep banks have been graded and planted to native grasses just above new rock protecting the streambank. The cost of the work was shared by Des Moines, Polk County, and the Des Moines Metropolitan Wastewater Reclamation Authority. The Wastewater Reclamation Authority had good reason to participate. 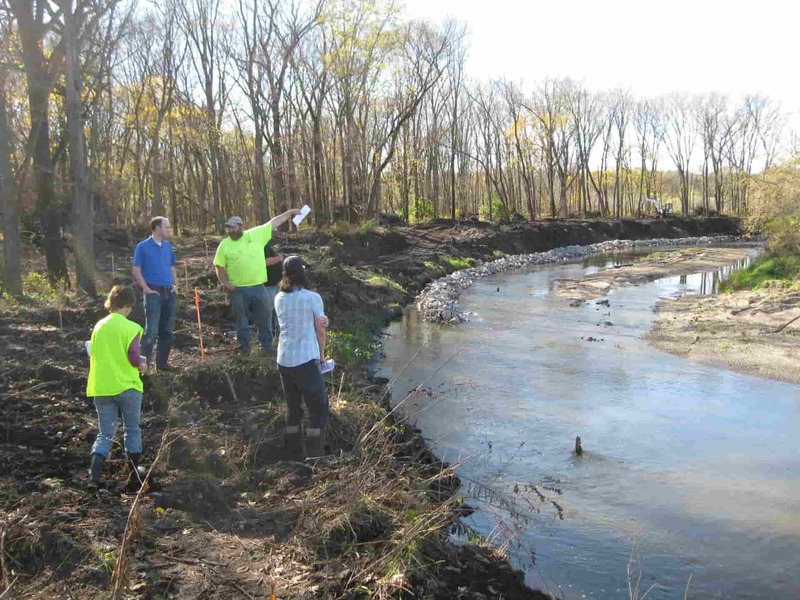 Streambank erosion threatened to damage sanitary sewer lines. 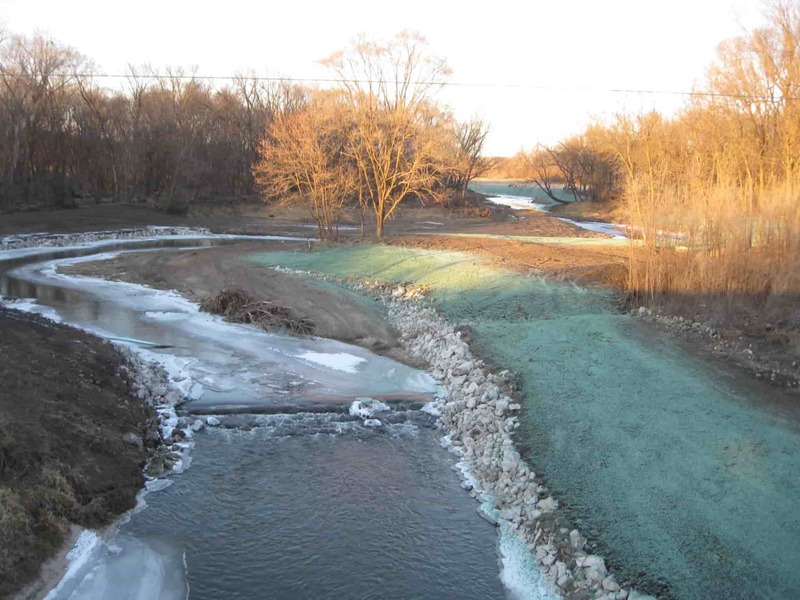 Middle Fourmile Creek benefits from improvements along tributaries in Ankeny and on farms, such as Harold Silver’s farm near the community of Berwick. Silver’s family has a strong history of conservation. Since the 1960s, a farm pond has been trapping silt before water flows into the Muchikinock Creek, a Fourmile tributary. For 12 years, he’s used no-till. Over the past two years, cover crops of cereal rye and tillage radishes have added more protection. A saturated buffer was installed in the summer of 2017 that will remove nitrates from his fields and those of two neighbors. Silver’s farm is high enough to avoid flooding, but neighbors along Fourmile Creek have seen worse flooding as Ankeny has grown. “It floods a lot more than it used to,” Silver says. Ankeny works to get ahead of the effects of paving more streets and building roofs. Both speed water toward streams. 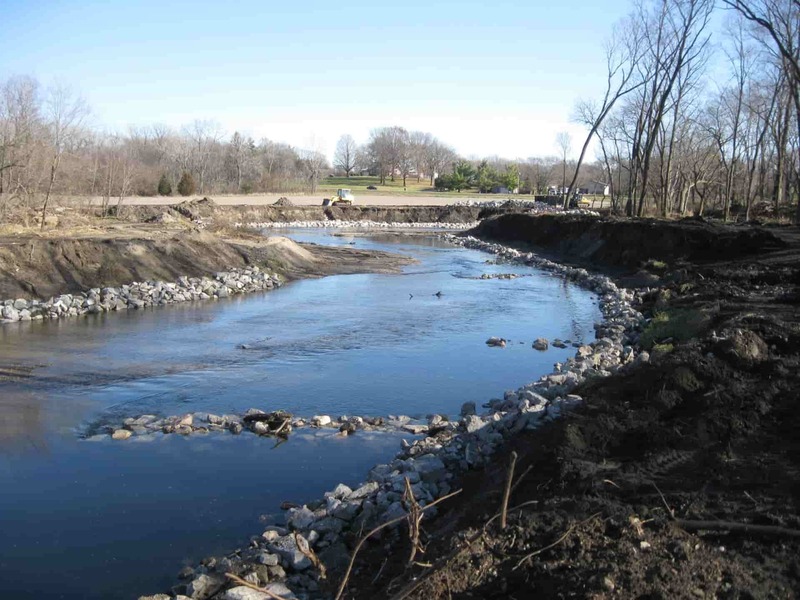 In fact, Ankeny was already working on stabilization before the Fourmile Creek Watershed Management Authority was formed, says urban conservationist Welch. “They realized there were a lot of areas that were small drainages but were big problems,” says Welch. 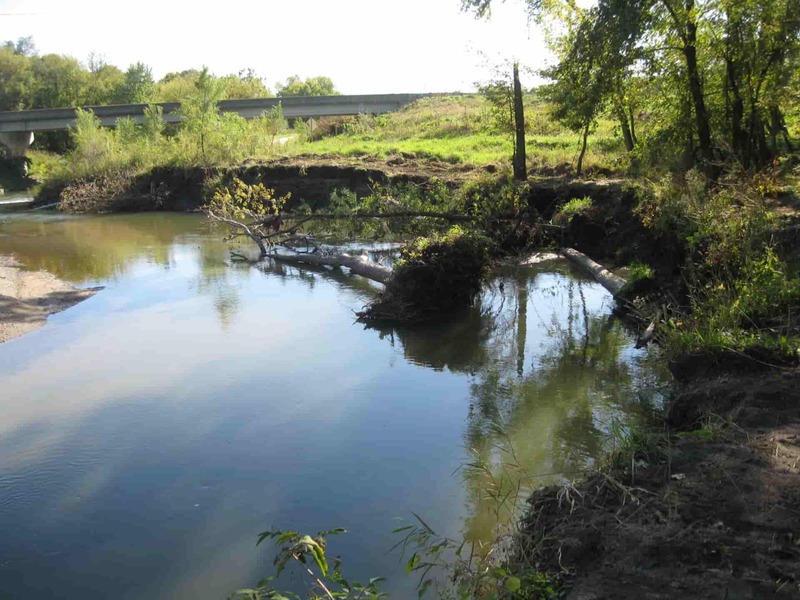 Previously, inconsistent methods of trying to protect streambanks were leading to more erosion. Visitors to Ankeny’s newer developments will notice lakes and ponds that slow down some of the runoff. 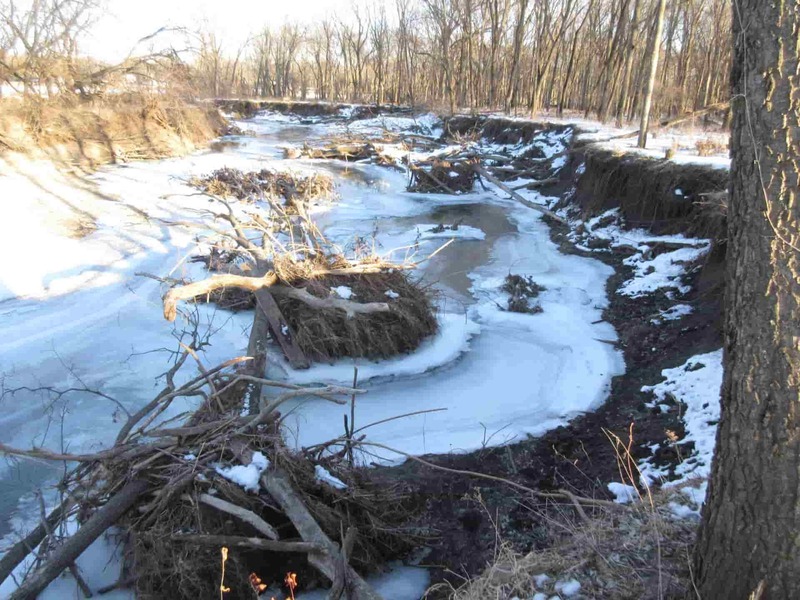 Ankeny has two creeks that feed into Fourmile, Tributary A and Tributary B. The city has already finished work to protect and slow runoff in both of them, says Amy Bryant, Ankeny’s environmental engineer. The city is also finishing a constructed wetland in the Woodland Reserve Greenway along Fourmile Creek itself. A good example of Ankeny’s work is Summerbrook Park on Delaware Avenue. This park straddles Tributary B with rocks along the stream edge and native prairie above it. A short section of permeable blacktop leads pedestrians past a rain garden planted in a “bioretention cell.” The cell cleans water coming off the street. “The idea was to add a lot of features so that people could see what they were and on a larger scale add them to their property,” Bryant says. Upper Fourmile Creek is primarily agricultural, and improvements in the stream are driven by changes farmers are making on their fields. “In the agriculture area, we’ve had a very good early response,” says watershed coordinator Swanson. Some farmers added edge-of-field bioreactors or saturated buffers to remove nitrates. Others are starting to use test strips to measure nitrate levels in water coming out of tile outlets. One who isn’t waiting is Kurt Lehman, a northern Polk County farmer who installed a bioreactor and a saturated buffer in 2016 and is working with researchers from Iowa State University and the Iowa Soybean Association to compare the effectiveness of each one. The farm already had native grass buffer strips along the stream that flows into Fourmile Creek. Not far from Lehman’s farm, the city of Slater in Story County is taking steps to slow water flowing into Fourmile Creek’s headwaters, says Mark Estrem, the city’s director of public works. This fall it will use a state grant to install permeable paving blocks in the town’s swimming pool parking lot. It has already planted prairie grasses at the south edge of town. To conservationist Welch, all those little things add up to progress. The job of improving water quality in Fourmile Creek won’t be done overnight. It could be 20 years or more, says Welch, as new practices are added and retrofitted. “I don’t think you’re ever done,” she concludes.